One of the most important things that a pastor does is to preach. The longer I am involved in ministry the more I realize how crucial that solid biblical preaching is to a local church. I have not come to this particular thought overnight but rather a process of about fifteen years. I am constantly in the hunt to look for books, MP3’s, seminars, and journal articles that will make me a more effective preacher. I am often surprised at how infrequently that preachers read books that sort of fall into the “how to” mode of preaching. I have recently purchased a book that I have had on a wish-list of sorts for almost a year now and have not been disappointed in its ability to deliver some hard facts about our generation of listeners and the preachers who preach to them. 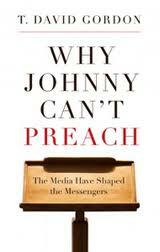 Why Johnny Can’t Preach by T. David Gordon is a must read for all preachers. The sub-title of the book is The Media Have Shaped the Messengers. It is a little over 100 pages and can be read through in an evening. I feel certain that you will be provoked by reading it if you are actively involved in preaching. Through the Bible to Andy Stanley’s book, It Came from Within, and I am shocked at the lack of depth between modern day preaching and what was commonly preached back then. Spurgeon and Parker loaded their sermons with Scripture and the illustrations and applications were all scripturally oriented. Lucado and Stanley were more geared toward warm fuzziness that at the end of the day will be like cotton candy. David Gordon tackles some of the issues facing our generation and points out how modern media methods have literally decreased the ability of both preachers and listeners to think for lengthy periods of time. Gordon takes his title from a book that was written sometime back Why Johnny Can’t Read that explored some of the reasons that children were having difficulties with reading comprehension. So before you scoff at what the book is implying, think for a moment back to Genesis 3. The first thing the serpent did in the Garden was cause Eve to doubt what God had said. Fast forward over a period of 6000 years and you still have the same thing going on. The serpent is still trying to get us to doubt what God is saying through His Word, the Bible. If he can degenerate the Word and dumb down the ability of the listener to accurately grasp the meaning of Scripture about 90% of his work is done. Gordon explores some of the pitfalls that preachers fall into. First of all he states that over years he has listened to multiple sermons that really had no discernible point whatsoever. Secondly he noted that many of the sermons had a text that was read by the minister but did not relate to the sermon and instead of hearing God’s will he heard a man’s opinion. Thirdly he discovered that most churches in their pastoral searches aren’t really looking for a preacher as much as they are looking for a social coordinator, a nice guy, a social fellow, and so forth. Gordon noted the reason pastoral search committees fell into this trend was the fact that most congregations had never really heard sermons that literally grabbed them by the lapel and held them to God’s high and holy standard. I am certain that some readers of this blog might associate such preaching to that of “hell-fire and brimstone” content. 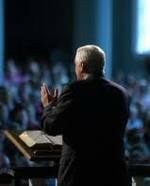 While that is a component of true preaching, it is by far only a small portion of the preaching content a pastor will do. Gordon explores Robert Lewis Dabney’s Lectures on Sacred Rhetoric and asks some very potent questions to the man who preaches. You will not go wrong considering what Dabney and Gordon ask about preaching. If you are a preacher and are content with your preaching—don’t buy this book, you will waste your money. However, if you are a preacher and there is a pressure in your soul to communicate well and promote truth, get this book and read it through once and then go back and read it again with a red pen. Mark it up and make notations in the margins because it will only help you to do more effectively what God has called you to do—preach the Word! 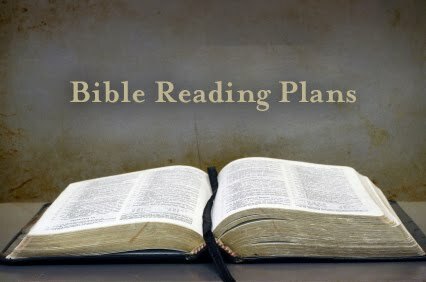 This last post to encourage you to read the Bible through in 2011 will be the most challenging one of all. It perhaps brings back those fears you had when you were in high school and you had a major gaffe when you were trying to quote “Mending Wall” by Frost or some ancient line of Shakespeare’s in front of the whole class. Frankly, I associate memorization of any sort with all sorts of torment particularly after Gerald Bryant, my old A&P teacher in college, who much against our will forced us to memorize the Kreb’s Cycle and the ins and outs of Frank Starlings law. Add to that the forced labor of Ellen Borland exhorting us to memorize Hamlet’s soliloquy and my fleeing from these sorts of modes of education are highly warranted. However, I have to think that memorizing Scripture does not even nearly fall into the same category. In fact, Don Whitney in his fine book on the Spiritual Disciplines stated that our whole attitude would change about memorizing Scripture if we were told that we were going to be paid $1000 for every verse we memorized. I have a feeling I could memorize at the very minimum, ten every week, probably more. It is a matter of motivation and priority as to whether you want to give yourself to such an activity. There are multiple benefits in memorizing Scripture. One of the foremost is that it gives us a sense of spiritual power. By memorizing Scripture, we can know what to do in situations that life brings to us. 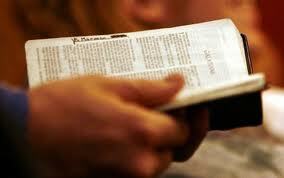 Psalm 119:11 encourages us to put Scripture in our heart so that we will not sin against God. One of the elements of armor in Ephesians 6:10-18 is that wielding of the sword of the Spirit. An accomplished and skilled soldier knows how to use his weapons. Every Christian should know how to use the Word. If you give yourself to the goal of reading through it in 2011, I have a feeling that there will be some changes in your thinking. You will find that Scripture opposes much of the common and pop psychology that the world dumps on us every single day. 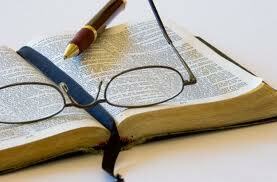 Scripture memorization will stimulate your mind toward meditation on godly things. Our society has increasingly become enamored with yoga and its supposed health benefits that it has. However, when you analyze the process of yoga, it is an emptying out of the mind rather than placing something in it. Empty minds create empty lives while Scripture-filled minds will create a godly mind. If anyone ever needed such an experience it is our generation. We need godly minds in pastors, husbands, wives, children, employees, employers, teachers, physicians, construction workers, attorneys, politicians, and every other occupation. The way I ended up memorizing the Kreb’s cycle for the famous Gerald Bryant, who was a local celebrity on our campus, was by drawing it out on a 3X5 index card and keeping it with me all the time. By the time I got to test time, the card was in terrible shape but I passed the test and that was what was important. I encourage you to do the same and write down 2 or 3 Scriptures on a card and keep it with you. Don’t lower the bar and stumble around with quoting it but hold yourself to a high standard and lock in your mind to the task. I recently found a link that has broken down Philippians in a way that if you are diligent about it, you can have it memorized by Easter. I also found a link to help you use a Moleskin to be very creative with a memorization plan. If you use a Moleskin this link can help to create your verse list. I also found a list that broke down the Sermon on the Mount from Matthew 5-7 that will allow you to memorize it entirely by the end of the year (listed below). It is also important to remember that you are not memorizing Scripture just for the sake of being able to say that you have a certain amount of verses in your resume. The goal of memorizing Scripture is for personal holiness and godliness. You will find the importance and necessity of reviewing what you have committed to memory as time passes but stay with and be a godly person. Before getting into recommending the various translations for 2011, my thoughts drifted back to 1990 or 1991 during my TBC days in Houston. Every year the campus would have a progressive dinner for all of the married couples. The staff and faculty of the school would host the couples in their homes and we would spend 30-45 minutes before moving on to the next course of the meal. When we got to the Griffin’s home, we all walked in and Brother Griffin greeted us. The girls gravitated to the kitchen with Sister Griffin and all the guys went in the den with Brother Griffin. He took his seat and one of the fellows asked, “Brother Griffin, what are you reading now?” His reply was met with a few loud guffaws and a few open mouths of surprise. He told us that he was reading through Nave’s Topical Bible and had almost finished with the “H’s.” We could hardly believe that he was serious but he was as serious as the proverbial heart attack. 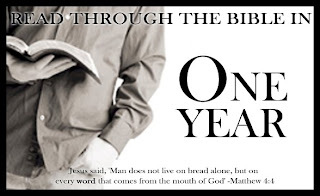 Brother Griffin’s normal plan of reading the Bible in a year was comprised of reading entirely through the KJV in the first three months. He would follow this with a varying translation such as the NIV, NKJV, NASB, or Nave’s Topical Bible. When he finished the second translation, he would then pick up a set of commentaries and read through that set of commentaries for the remainder of the year. He was very high on R. D. Lang’s commentary as he had read it numerous times. I do realize that his job so to speak of teaching at a Bible college caused him to have to spend time with the Bible and all matters surrounding it but there was sufficient motivation for me to attempt to follow his pattern. When I discovered some of the older translations of the Bible, I found a gold mine of sermon fodder and Bible study material that hopefully enhanced my preaching. I will share some of those a bit later in this post. ESV—The English Standard Version is probably the hottest (and newest) translation that is being touted on the market today. If you have the means to purchase the ESV Study Bible, you will have a wealth of material to glean from. NASB—The New American Standard Bible is a translation that I have come to enjoy over the last five years or so. While my primary will probably always be the KJV, I do find that the NASB has the ability to open up some passages in a greater way. NIV—The New International Version is another translation that is quite modern in some of its renderings. This is a version that I have not spent a lot of time with in the last 10 years or so. Occasionally I will look up verses to see what the comparison with the KJV is but it hasn’t been a primary focus for me. Weymouth—This is another translation that I happened to stumble across. I found a 1902 leather edition in a used bookstore several months ago. It was in awful condition but I took some leather cleaner to it and it cleaned up remarkably well. You should read Ephesians 4:20-32 and you will see what kind of wallop it packs. I used it one Sunday night several months ago. I am continually awed at the power of the Word in my own life and the life of a church that honors the Word. J. B. Phillips—This is a translation that was written in the 1940’s. It was written by a pastor who was preaching through the epistles in an expository fashion. He took the original Greek text and re-wrote it according to the word studies that he did in preparation to preach. I also found out that Elisabeth Elliott in her early years had a leather copy (which is unavailable now) that she had underlined with a pencil and written in the margins of it before it was lost in her luggage during air travel. The Message—This is a paraphrase written by Eugene Peterson and is a very potent expression of the Scriptures. I have enjoyed reading Peterson’s books over the years and I think he did a very good job with his paraphrase. Just as a word of caution, with any paraphrase (Living Bible, New Living Translation, etc.) the focus has to be for devotional inspiration and not for doctrinal instruction. A paraphrase of the Bible is never a good benchmark for doctrine. A paraphrase is only good to stoke the fire of your imagination. The Chronological Bible—This is a good Bible that arranges Scripture in a chronological fashion which is sometimes helpful for us. I have not spent a lot of time with this particular Bible although I have benefited from it with individual studies. Spurgeon’s Devotional Bible—This is handy little tool to have if you can find it. I have a copy of it that was published by Family Christian Stores 10+ years ago. I have never noticed a copy again at any bookstore that I have gone into. If you have the Metropolitan Tabernacle Pulpit which is Spurgeon’s massive 63 volume collection of sermons, you have probably noticed that there are some passages of Scripture that CHS annotated. The Spurgeon Devotional Bible is the collection of those found in the MTP. The Word (The Bible in 26 Translations)—This is another very good tool to have in your library. It is filled with 26 different translations and it will help you with some great devotional thoughts. There are various other Bibles that are not necessarily different translations as much as they are a collection of material that the author has written. For instance, the Max Lucado Grace for the Moment Daily Bible and the Charles Stanley Life Principles Bible are a couple of good ones. 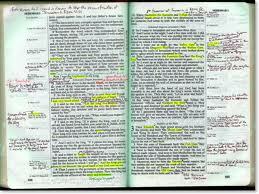 Charles Swindoll also has an Insights Bible with a lot of his notes in the margins. I have found that these Bibles and their devotional additions are helpful to me when the gas tank is empty. Read your Bible through in 2011. . .
One thing that generally comes with the New Year is a commitment to read through the Bible. Where is the best place to start? Old Testament? New Testament? What is the best translation? Can I do it? What are some things that will keep me accountable? Of what importance are all the genealogies? How do I stay motivated? Why can I never make it all the way to the end? Why do I get distracted with other things? All of these questions and a few others have been asked of me over the years. Where to start? The easy way to do it is to start with Genesis and don’t stop until you get to Revelation. A good general rule of thumb to remember is that reading through four chapters a day will get you from beginning to end in a year’s time. Obviously by doubling to eight, you can make it through in six months or by reading sixteen chapters a day you can make it in a quarter. Another way to add a twist to it is to take the Psalms and read five of them a day although when you get to Psalm 119 you will have to allocate a bit more time. Additionally read one chapter of the Proverbs every day. When the end of the year comes you will have read through the Bible completely once and have covered the Psalms five times and the Proverbs twelve times. Obviously with this pattern you will omit the reading of the Psalms and Proverbs when you come to them in a sequential manner. Another plan to use actually helps you to read through the New Testament thirty-one times in a three year period. To get the idea for using this pattern, begin with Philippians which is a short book consisting of four chapters or 1st John which is five chapters. Read the epistle you have chosen every day for the month of January and then move on to another epistle in February. When you come to the larger books like the Gospels, Romans, and Hebrews break them up into seven or eight chapter increments and read them as you did with the shorter epistles. I can vouch for this method working as I have used it at various times in the past and you will find a great increase in the ability to cross-reference Scripture. Furthermore, you will find an ability to loosely memorize what you are reading. When I say loosely memorize; it may be that you won’t quote it exactly but you have a good head of steam in doing so. What follows below are some links that you can download reading guides and print them out. Robert Murray McCheyne Reading Plan -- This works through the Bible in different areas. Don Carson gives a helpful explanation for the McCheyne plan. Don Whitney Reading Plan -- This downloads as a Word doc so you can cut it into an 8 ½ X 5 ½ sheet and slip into your Bible. Professor Grant Horner’s Reading Plan -- Very interesting approach. Read through the Bible for Shirkers and Slackers (I am not kidding). The Discipleship Journal Reading Plan. Faith Comes by Hearing offers multiple translations and even some dramatized editions. Firefighters for Christ KJV downloads. When people begin to read through the Bible, there is a component of spiritual growth that starts to develop in their life. Suddenly what God has to say is more important than all the advice that the world is feeding to us. Furthermore it will heighten your attention to the Word when a pastor is preaching. More on translations tomorrow. . .